Originally published in Playbill magazine in June 2012. 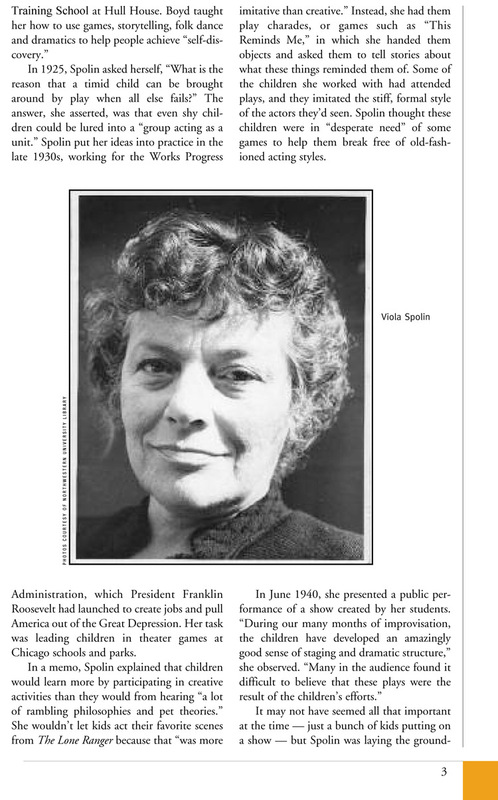 Theater and comedy in Chicago wouldn’t be what they are without Viola Spolin. She may not be quite as famous as others who left their marks on the city’s theater scene — such as playwright David Mamet or performer John Malkovich — but as an innovator who devised a set of games that allow actors to improvise and project profoundly truthful performances, she has had a lasting effect on the way actors and comedians play. 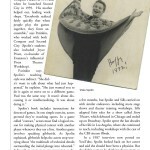 Spolin’s son, Paul Sills, used those games as the foundation for The Second City’s sketches. Eventually, Second City changed the way comedy is performed on stages and screens everywhere, spawning TV shows such as Saturday Night Live, plus countless films and improv troupes. “Her influence is everywhere,” says Patinkin, an early member of Second City who’s still directing today — and still using Spolin’s techniques. 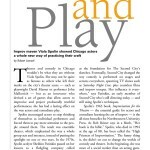 Spolin’s 1963 book, Improvisation for the Theatre — the essential guide for actors and comedians learning the art of improv — is the all-time bestseller for Northwestern University Press. 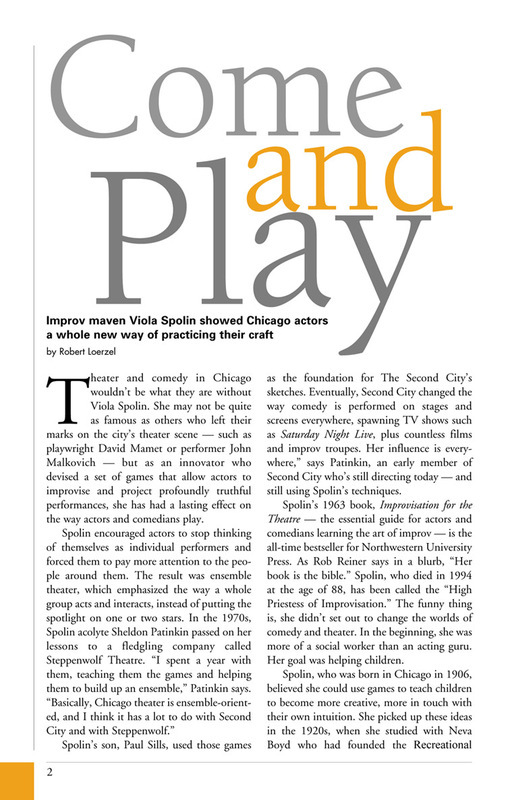 As Rob Reiner says in a blurb, “Her book is the bible.” Spolin, who died in 1994 at the age of 88, has been called the “High Priestess of Improvisation.” The funny thing is, she didn’t set out to change the worlds of comedy and theater. In the beginning, she was more of a social worker than an acting guru. Her goal was helping children. In 1925, Spolin asked herself, “What is the reason that a timid child can be brought around by play when all else fails?” The answer, she asserted, was that even shy children could be lured into a “group acting as a unit.” Spolin put her ideas into practice in the late 1930s, working for the Works Progress Administration, which President Franklin Roosevelt had launched to create jobs and pull America out of the Great Depression. 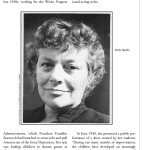 Her task was leading children in theater games at Chicago schools and parks. In a memo, Spolin explained that children would learn more by participating in creative activities than they would from hearing “a lot of rambling philosophies and pet theories.” She wouldn’t let kids act their favorite scenes from The Lone Ranger because that “was more imitative than creative.” Instead, she had them play charades, or games such as “This Reminds Me,” in which she handed them objects and asked them to tell stories about what these things reminded them of. Some of the children she worked with had attended plays, and they imitated the stiff, formal style of the actors they’d seen. Spolin thought these children were in “desperate need” of some games to help them break free of old-fashioned acting styles. It may not have seemed all that important at the time — just a bunch of kids putting on a show — but Spolin was laying the groundwork for decades of theatrical advances in Chicago. Paul Sills played his mother’s games with adult acting ensembles at the Compass Theater in 1955 and when he launched Second City in 1959. His mother helped out, leading workshops. “Everybody realized fairly quickly that when people play the games together, they form an ensemble,” says Patinkin, who worked with both Compass and Second City. (Spolin’s students also included Joyce Piven, co-founder of Evanston’s influential Piven Theatre Workshop). In 1965, Spolin and Sills left Second City to start the Game Theater, creating shows in which the audience would participate in actors’ games. 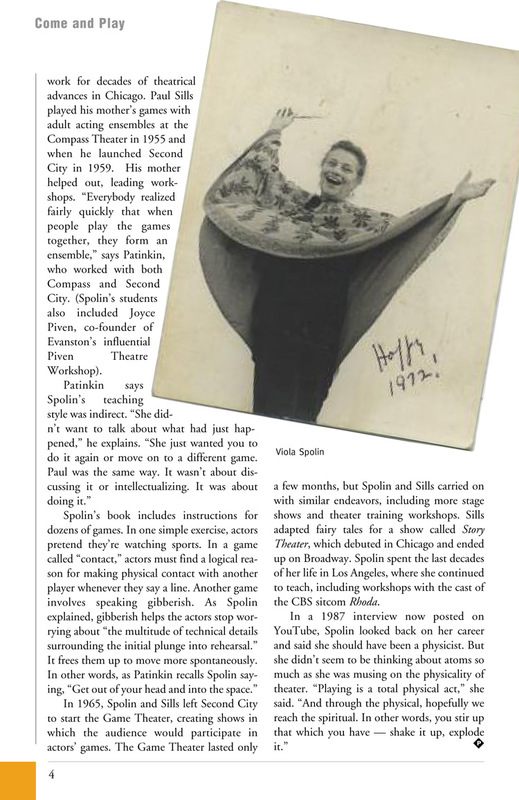 The Game Theater lasted only a few months, but Spolin and Sills carried on with similar endeavors, including more stage shows and theater training workshops. Sills adapted fairy tales for a show called Story Theater, which debuted in Chicago and ended up on Broadway. Spolin spent the last decades of her life in Los Angeles, where she continued to teach, including workshops with the cast of the CBS sitcom Rhoda.